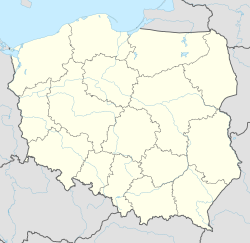 Żory [ˈʐɔrɨ] (German: Sohrau) is a town and city county in Silesian Voivodeship, Poland with 58,640 inhabitants (2018). Previously it was in Katowice Voivodeship (1975–1998). It is located in the historic Upper Silesia region about 30 kilometres (19 mi) southwest of Katowice. Saints Philip and Jacob parish church. The settlement on the road from Cieszyn to Kraków was first mentioned in a 1258 deed. Żory is one of the oldest towns in Silesia, it was granted city rights according to Magdeburg Law on 24 February 1272 by Duke Władysław of Opole. It remained part of the Upper Silesian Duchy of Opole, since 1327 a Bohemian fief, until in 1532 it was incorporated into the Lands of the Bohemian Crown. After the First Silesian War it was annexed by Prussia in 1742. In the 18th century it was centre of cloth manufacturing, later of metal and machining industry. Upon the 1921 Upper Silesia plebiscite, Sohrau fell to the Silesian Voivodeship of the Second Polish Republic, though 69.4% of the citizens had voted for Germany. Occupied by Nazi Germany during the 1939 Invasion of Poland, it was re-conquered in the Vistula-Oder Offensive of the Red Army in 1945 and the German population was expelled. The town is subdivided into 15 districts. Pogoń 1922 Żory - women's handball team playing in Polish Ekstraklasa Women's Handball League: winner of 1st league in 2003/2004 season; promoted to Premiership in 2004/2005 season. ^ "Stan ludności miasta Żory na 30.06.2018r" (in Polish). Retrieved 2018-07-23. ^ "Dzielnice Żor" (in Polish). Retrieved 2015-05-06. Wikimedia Commons has media related to Żory.